A one-of-a-kind Renoir painting the size of a napkin is at the center of an intense legal battle between a museum that claims it was stolen and a Virginia woman who claims she bought it for $7. The tiny work of art is an 1879 landscape by the Impressionist painter titled "Paysage Bords de Seine." In court papers filed this week, the Baltimore Museum of Art claims the painting was stolen in 1951. As evidence, the Museum provided a 60-year-old police report, old museum catalogues and a receipt showing that a patron bequeathed the painting to the museum. In her own court filings, filed last month, Martha Fuqua contests the museum's claim, saying she purchased the painting at a flea market in 2009 for just $7. The two sides will meet in court again next week. Neither Fuqua nor her attorney replied to ABC News' request for comment. The documents discovered by the Washington Post reporter indicated that the painting belonged to Saidie May, a well-known art collector and major benefactor to the BMA. The artwork was reported stolen on Nov. 17, 1951, according to the documents, shortly after May's death in May of that year. "The Baltimore Museum of Art is hopeful that it will soon be able to welcome home the Renoir painting that was stolen from its gallery walls more than 60 years ago. This would be a wonderful way to celebrate the BMA's 100 th anniversary and the legacy of donor Saidie May," a museum spokeswoman said in a statement to ABC News. A museum claims the tiny, one-of-a-kind artwork was stolen more than 60 years ago. What a super little painting. it sounds like this has spent some time moving around. Now a judge has ruled it must be returned to museum. Here the full report. ALEXANDRIA, Va. (AP) -- A federal judge on Friday awarded ownership of a disputed Renoir painting to a Baltimore museum, citing "overwhelming evidence" that the painting had been stolen from the museum more than 60 years ago. The judge's decision rejected the claims of a Virginia woman, Marcia "Martha" Fuqua, who maintained that she bought the painting at a flea market for $7, even as others, including her own brother, disputed her story. In making her ruling Friday, U.S. District Judge Leonie Brinkema did not pass judgment of the truthfulness of Fuqua's story. The judge said merely that because the museum had shown the painting was stolen, it didn't matter how Fuqua acquired it — she could not legally gain possession of stolen property even if she acted in good faith. Fuqua did not attend the hearing. Her lawyer, Wayne Biggs, declined to comment on whether he would appeal. The napkin-sized painting made news in 2012 when an auction company announced plans to sell it on behalf of an anonymous woman dubbed "Renoir girl" who said she bought the painting at a West Virginia flea market in 2009 for $7. The woman said she did not know the painting was a Renoir when she bought it, even though it was held in a frame with a "RENOIR" panel attached. The auction company had expected to fetch at least $75,000, but the auction was canceled when the museum came forward with long-forgotten records showing the painting had been stolen in 1951. As it turned out, Fuqua's mother, who used the name Marcia Fouquet, was an artist who specialized in reproducing paintings from Renoir and other masters, and who had extensive links to Baltimore's art community in the 1950s. In addition, Fuqua's brother, Owen "Matt" Fuqua, told a Washington Post reporter that he had seen the painting in the family home numerous times, well before his sister supposedly bought it in 2009, though Matt Fuqua changed his story several times subsequently. The FBI seized the painting in October 2012 and has been keeping it while the courts sorted through the ownership claims. After Friday's hearing, Matt Fuqua said he was glad the museum is getting the painting and called his sister a liar. "I'm ecstatic because the truth came out," he said. He said a deposition he gave to lawyers supporting his sister's version of events was a lie. "At the time, I was trying to protect her," he said. Matt Fuqua said after the hearing that he suspects somebody gave the painting to his mother. "She was beautiful back in the day," he said of his mother, who died recently. "She had a lot of suitors." Matt Fuqua said he asked his mother many times about the painting's origins, but she wouldn't say. "It was secretive, and I wasn't very good at keeping secrets," Matt Fuqua said. Martha Fuqua maintained throughout the case that she bought the painting at a flea market and gave a sworn statement under penalty of perjury as part of the court case. Her lawyer tried to argue that the museum's claims were inadmissible because the documents were so old that nobody could attest to their accuracy. But Brinkema said the museum's documentation was legitimate. "All of the evidence is on the Baltimore museum's side. None of the evidence is on your side," Brinkema told Biggs. Anne Mannix-Brown, spokeswoman for the Baltimore Museum of Art, said the museum hopes to have a special unveiling of the painting some time by the end of March. It will be the 47th Renoir in the museum's collection. Renoir painted "Paysage bords de Seine," or On the Shore of the Seine, on a linen napkin in 1879 on the spot at a riverside restaurant for his mistress, according to an FBI appraisal of the work. 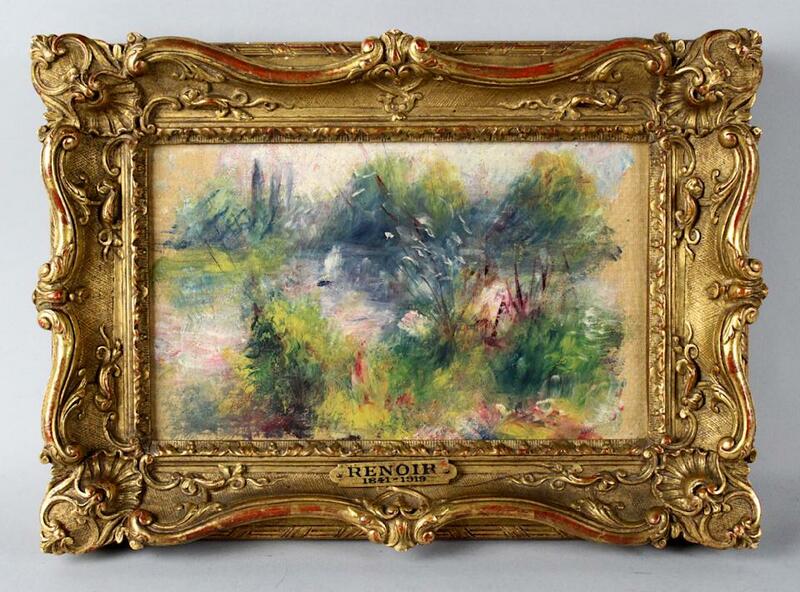 The appraiser estimated its value at about $22,000, much lower than the auction house believed, in part because the appraiser said Renoir's paintings have fallen out of favor with some art collectors who consider them old fashioned. The artwork, reportedly bought at a flea market for $7, was stolen more than 60 years ago, a judge rules.